As they say, politics starts from the Tea stalls. The statement has a bigger role to play when it comes to Indian Politics. The other day, when I was having a cup of tea in a Tapri outside my office during lunch hour, I got to hear few strategic comments on what's going around Andhrapradesh and the subsequent repercussions of the turmoil on Maharastra. Andhra mesh having an effect on Maharastra ? Just wondered for the possible relationship. Before my brain could start working on the confusion at hand, the man with a cutting in one hand and a gold flake in other cleared it at once.The reasons varied from being neighbouring states to in/out flow of Naxals across the border and what not. I must say a genius at work. On a serious note, the gentleman with a Viku Mahatre look and artier was bang on target when he narrated the miss-happenings in Andhrapradesh. Not so sure about the argument he gave forward about the possible repercussion of the Andhra mesh on Maharastra Politics or people at large though. When we were at school we were struggling and getting caned for not mugging all the 25 states and their respective capitals by our Sheela Dixit Look alike Geography teacher. I feel pity on current generation students, where they had to do the same exercise for 28 states. As if this was not enough, guys like KCR, Mayawati and lesser known entities like Bimal Gurung (Head of Gorkha Janmukti Morcha) are trying their best to make sure that the respective backs of the hapless students should carry the outline of India Map, carved out by the canes of all such Sheela Dixit look alikes, for not knowing their country's geography properly. I am sure these poor students with sore backs would be seeing KCR and team in the same light of Aurangzeb. The Telengana Pandora's Box has made ways for states like Vidarba, Bundelkhand, Purbanchal, Harit Pradesh, Gorkhaland to be carved out from some part or other of India. T. Ramarao (Son of KCR) who was spearheading the media campaign while KCR was cooling his back in hospital, was very much vocal about the demand and the people of Telengana as a whole. The slogan was quite interesting: something in line with what our own Raj Thakrey would have felt proud off. "Andhra wale Bhago, Telengana wale Jagoo". When asked the meaning of the same, Mr. Rao with a little American ascent stammered for first few seconds, and then came with an answer, which you can only expect from a politician only. He advised all to get the context not the meaning . As if he wanted to say : "Bhabnaon ko Samjho". Just wondering where was the very sentiment of the so called Telengana buddies when it came to 2009 general election where poor KCR couldn't even able to open his scorecard. It's pity and strange that with only having 14 presentations for themselves in state assembly, these guys shamelessly go on to talk about the sentiment and feeling of a whole region. It seems Congress and more precisely the dhoti clad home minister were more convinced with the silly demands of KCR than KCR himself. After all you can expect all the gimmicks and surprises in the wrong term, when this party is in power. So I was not at all surprised when Mr.Chidambaram woke up at 12 O'clock at night after the alarm clock buzzed and announced to the whole world that we are having the 29th state soon for sure.What resulted was quite shameful after that. The IT city of Hydrabad was on the streets. Complete block down of business, services, biriyani stalls, wondering public at Hussen Sagar, Fully loaded Andhra trucks with chicken & vegetables, Tinku, Tinki's math teacher not showing up as he was busy demonstrating either for or against the move etc. There were so many casualties,and the latest being the shifting of the 2nd ondayer from Visakhapatnam to Nagpur. Guys in and around the port city won't be too exited on this development. Few might be comprehending the idea of getting hold off few kgs of RDX and KCR's home address to administer the stuff promptly. Not in KCR's home but somewhere else I presume. After all a match after 5 long years is gone without any substantial reason. Mayawati, who always wish, want and hope to be in the news for all the wrong reasons came up with her own set of dirty gimmicks.After all she is a master of all nonsense. 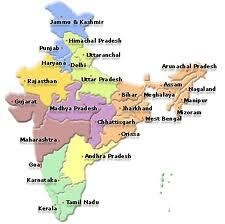 Suddenly she advised none lesser than the PMO to carve out two more states from UP. Namely Purbanchal and Bundelkhand. Well Ms.Mayawati finally accepted to shed off some power by creating more states or are those regions doesn't constitute much when it comes to her birthday contribution. I put my money on the second reason. Politicians would remain one always. But it is for all human beings to see for themselves what they want. for the sake of Unity, Good governance, Commerce and last but not the least Tinku, Tinki's math teacher, we should refrain ourselves from all such non-useful things and get on with our own business. Irrespective off where we belong. Telengana, Bundelkhand or Purbanchal.